On the 996 and 997, the fender intakes behind the side doors are only on the turbo models, since they feed cool air to intercoolers for the turbos. The GTS and Speedster are wide-body cars, (wider rear fenders like Carrera 4, Turbo, GT3 RS, and GT2 models. But the non-turbocharged cars don't have the intakes. 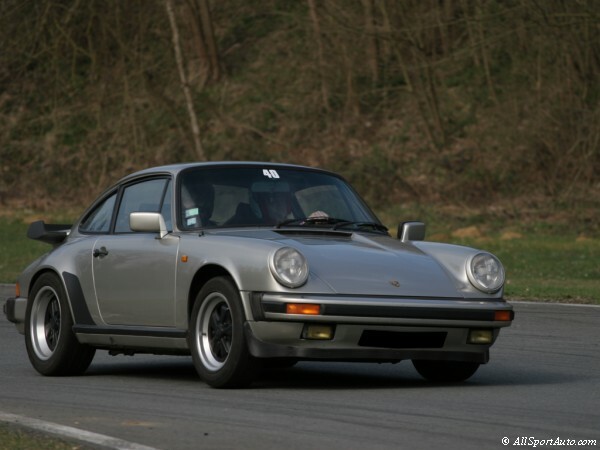 Only the Turbo, and the GT2 have them, because they are the only ones with side-mounted intercoolers. The engine cooling is handled at the front of the car, with two radiators under the turn signal and running light assemblies, and the upper models with more power have a third radiator in the center intake, possibly along with an oil cooler, IIRC. The cars haven't been directly air-cooled in a long time. Ever driven an elise, s2000, boxster? The whole point of a sportscar is to enjoy the experience and all road cars are compromised. At least the listed cars arnt "hindered" with 4 doors and soft strut based suspension on all 4 corners. You're complaining that a soft top "hinders performance". Road cars are a balance of compromises, many people are happy to trade a bit of performance for an open top car. You traded some performance by getting a four door econobox, which makes a much better daily driver than an uncompromised race car would. The point you're missing is there are many buyers in the market, most do not have your priorities. And that's a good thing. 28 responses and nobody has noticed the return of the rear flank stone chip guards look? And Fuche look wheels. It's called the retro bandwagon. that "hump" in the rear kinda messes up the flow of the car IMHO. 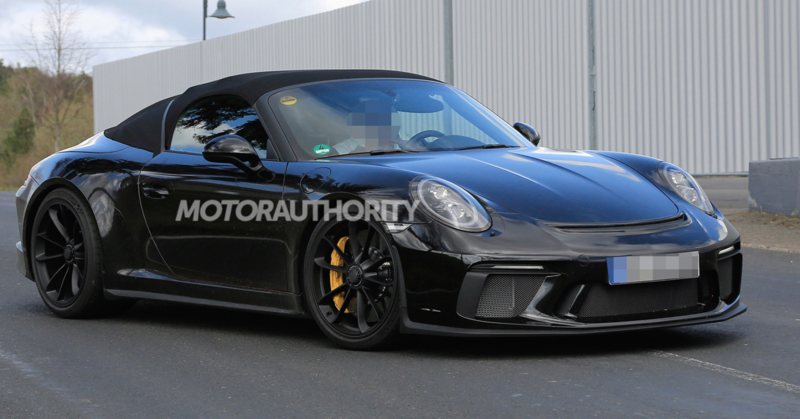 The car will be a limited edition 911 Speedster, a prototype for which has just been spotted. Some readers will recall Porsche did the same with the previous-generation 997 911 family. Porsche has done its best to hide the Speedster's unique design traits but we can see signs of a double-bubble rear deck as well as the car's more streamlined soft-top roof hiding under a makeshift unit. The windshield is also more raked than on other 911 models from this generation. Look for the 911 Speedster to debut later this year as a 2019 model. An appearance at either the Paris auto show in October or the Los Angeles auto show the following month is a strong possibility. For cars with the double-bubble the Boxster Spyder is a much better looking car than a 911 Speedster. The speedsters are fugly and make the Panamera look good. The new rear section could come from the additional space requried for a hybrid powertrain. But although the 992 generation 911 will be the first to be offered with hybrid technology, this technical change will have no noticeable impact on the car's exterior design. The raised rear is a design feature, rather than technical requirement. Next 911 will be first available with hybrid powertrain, but the Turbo will retain a pure combustion powertrain.The 2019 Porsche 911 will receive a more muscular look featuring a raised engine cover that takes influence from the iconic design of Speedster models from yesteryear. The GT3 will deliver more than 500bhp, while the standard models will get an extra 10-15bhp over today’s Carrera/S current Carrera/S deliver 364bhp and 414bhp so the 992-generation 911 will produce 375bhp to 429bhp.The future 911 including the GT3, will use turbocharged six-cylinder engines, marking the end of naturally aspirated engines.The hybrid 911will be introduced in 2020. It will [email protected] the flat six with an electric motor, providing limited all-electric /performance-boosting functions. The electrified powertrain has provided engineers with a packaging challenge, but product line director Erhard Mössle said "CO2 regulations in 2020" have started the hybrid model's development. The range will be headed by a 630bhp Turbo S model, powered by a beefed up version of the current car's 3.8-litre flat six to make it a threat to the Ferrari 488 GTB. No hybrid tech.. The flagship series model will borrow engine hardware from the GT2 RS to ensure that its output jumps by 50bhp compared with today's Turbo S - edging it to within 30bhp of the 488 GTB. The regular Turbo model that sits beneath the S is predicted to have 592bhp, which is 61bhp more than today's 991 version. Both able to blow over 200mph.. Performance..2.9sec 0-62mph time of the current Turbo S beaten and the Turbo below the 3.0sec mark for the first time. The hybrid 911 model will be introduced to the range in 2020. It will run the flat six with an electric motor, providing limited all-electric and performance-boosting functions. The range will be headed by a 630bhp Turbo S model, powered by a ramped up version of the current car's 3.8-litre flat six to make it a genuine threat to the Ferrari 488 GTB. Porsche engineers have decided against including hybrid technology on the variant in a bid to save weight. The future flagship series model will borrow engine hardware from the GT2 RS to ensure that its output jumps by 50bhp compared with today's Turbo S - edging it to within 30bhp of the 488 GTB. The regular Turbo model that sits beneath the S is predicted to have 592bhp, which is 61bhp more than today's 991 version. Both the Turbo and Turbo S will be capable of more than 200mph. Good little clip gt2 RS Weissach..
Really, this looks like a GT3 Touring with a roof similar to that on a 911 Cabriolet. If you look closely, you can see it's not quite the same. The back half of the convertible top has some camouflage. Based on these images, it looks like it attaches in the same way as the upcoming Porsche 718 Boxster Spyder. Beyond the roof, the Speedster swipes the bumpers and wheels from the GT3 parts bin. We're hoping it has the car's slick manual transmission, too. Expect to see the 911 Speedster's debut sometime this fall. If you want one, you should be making calls to your local dealer ASAP. The last model was limited to just 356 examples. We expect the new one to be in similar short supply. Im not crazy about that rear view, but that's the first open top (targa excluded) 911 that I'd ever like to own. Not bad, Porsche. while the six-speed manual gearbox and the flat-six naturally aspirated engine with more than 500 horsepower also wear the GT’s signature. The styling would make more sense if it was mid-engine, IMO. Enough people have been running them on the 993, 996, 997, 991 that it being a factory option is only something that gets the purists excited. Agreed. But at least this looks better than the current targa. Personal opinion: There is no such thing as a good looking targa. Agreed. 993/996 are the best looking, but they should have kept the coupe's roofline/rear quarter window. Last year Porsche pretty much confirmed a new 911 Speedster when it unveiled a thinly disguised concept version and next week we’ll get to see it at the New York Auto Show. 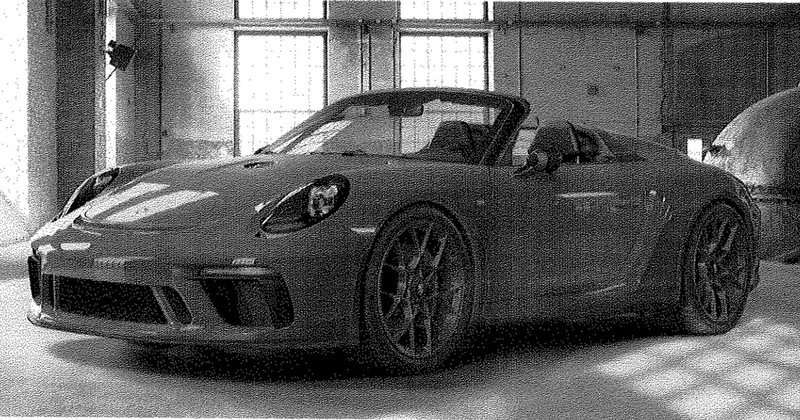 Porsche has reportedly notified customers that it will reveal the new 911 Speedster next week and even sent out a teaser photo. A source sent a copy of the invitation to CarBuzz, that Porsche has sent out to customers. The invitation invites some lucky customers to a special charity cocktail party on April 18 “for the unveiling of the new 911 Speedster.” That means that the 911 Speedster will likely debut just before the cocktail party during the press days portion of the New York Auto Show on April 16 and 17. If you’re hoping to get one, it’s going to be hard, since Porsche only plans to build 1,948 911 Speedsters. We also know that it will be powered by the same 4.0L naturally-aspirated six-cylinder as the GT3. First good looking 911 speedster IMO. Seems like Porsche is following the Boxster/Cayman nomenclature and this is a drop top GT3.